Hibernian midfielder Merouane Zemmama is poised for a surprise season-long loan move to Al Sha'ab in the United Arab Emirates. The Edinburgh club say that the 24-year-old is being allowed to leave Easter Road on compassionate grounds. Zemmama recently married, but his wife Zineb is now expecting their first child and, at 17, is too young to be allowed into the United Kingdom. 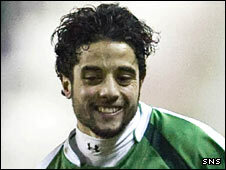 The player has been with Hibs since arriving from Raja Casablanca in 2006. Hibs insist that the Morocco international, who is in Dubai to hold talks with Al Sha'ab and undergo a medical, still has a future with the Scottish Premier League club. The Edinburgh outfit said in a statement: "Manager Mixu Paatelainen gave Zemmama permission to explore this option on compassionate grounds. "Zemmama returned to Morocco in the summer to be married to Zineb. "Attempts to bring Zineb to Edinburgh faltered over a Home Office regulation, which prohibits a permit being issued to anyone under 18 years of age. "The recently-wed couple were delighted to discover that Zineb is now expecting their first child. "The club has been sympathetic to Zemmama's pleas to be with his family at this important time, so a year long loan to Al-Shaab, where he can be joined by Zineb, seemed to be a suitable arrangement. "Should the loan arrangement be concluded, Zemmama would return in the summer of 2009 with two years left on his contract with Hibernian." Zemmama's Hibs and Morocco team-mate Abdessalam Benjelloun also recently left the club on a loan deal, joining Belgian outfit Royal Charleroi until January.